Bernard Wood recently came to give a talk at Michigan. While he was discussing the utility of the concept of genus for thinking about human evolution, he mentioned something I found interesting. Wood referenced a research project on anatomical homologies and homoplasies in the soft tissue of the head, neck, pectoral region and upper limbs of extant primates, and mentioned that humans often weren’t as unique as you might think. He noted that even lizards have more extrinsic muscles in their hand than humans, which ran contrary to the expectations of most people in the audience. 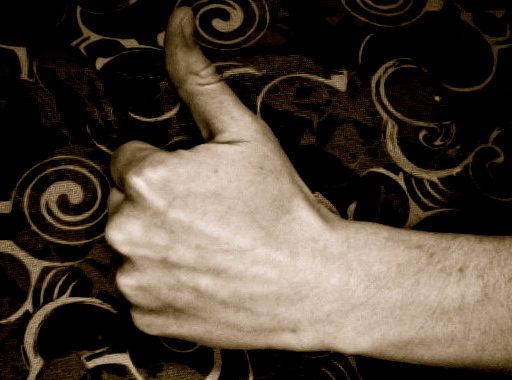 The real anatomical difference in humans, Wood underscored, is in how many muscles go to the thumb. And actually, the musculature surrounding your thumb is more complicated than you might think. I know exactly how many muscles insert onto that digit, because I had to memorize their names and attachment sites for anatomy written exams. That can’t be too bad, I hear you thinking. There’s likely a flexor and an extensor, right? Maybe two or three muscles? EIGHT. EIGHT MUSCLES INSERT ONTO THE THUMB. That still doesn’t sound so bad, until you realize that there are 19 intrinsic and extrinsic muscles that insert onto the hand alone. Dr. Harry Maisel, who guided me through Human Gross Anatomy, was adamant that we know where each of these muscles attached to the thumb, as well as what their action was. The best way to learn all of this, I found, was to draw out a schematic picture. Below, you’ll find poorly drawn outlines of MC1, the proximal phalanx and the distal phalanx, and approximations of the muscle attachment sites themselves. Flexor Pollicis Longus: Origin: Anterior radius and interosseous membrane. Action: Flexion of distal phalanx of thumb + proximal phalanx. Innervation: Median nerve (C7, C8+T1). Adductor Pollicis: Origin: Oblique head = bases of MC2, MC3 + Capitate. Transverse head = anterior surface of MC3 body. Action: Adducts proximal phalanx towards MC3. Innervation: Deep branch of ulnar nerve (C8 +T1). Flexor Pollicis Brevis: Origin: Superficial head = Flexor retinaculum + Trapezium. Deep head = Floor of carpal canal. Action: Flexes proximal phalanx of the thumb at MCP joint. Innervation: Recurrent branch of median nerve (C8 + T1). 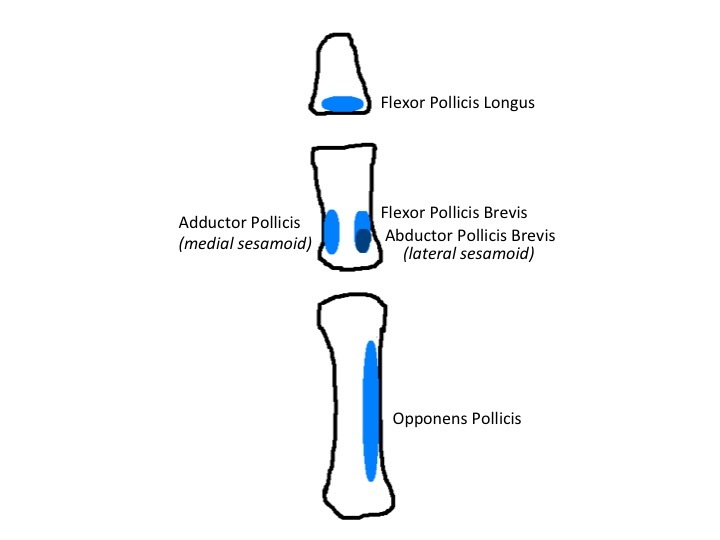 Abductor Pollicis Brevis: Origin: Flexor retinaculum, scaphoid + trapezium. Action: Abducts thumb at CMC and MCP joints. Innervation: Recurrent branch of median nerve (C7+C8). Opponens Pollicis: Origin: Flexor retinaculum and trapezium. Action: Pulls and rotates MC1 across palm (opposing it against fingers). Innervation: Recurrent branch of median nerve (C8 + T1). Extensor Pollicis Brevis: Origin: Posterior surface of radius and interosseous membrane. Action: Extends proximal phalanx of thumb at MCP joint (and can also extent MC1 at CMC joint). Innervation: Radial nerve (C7 + C8). 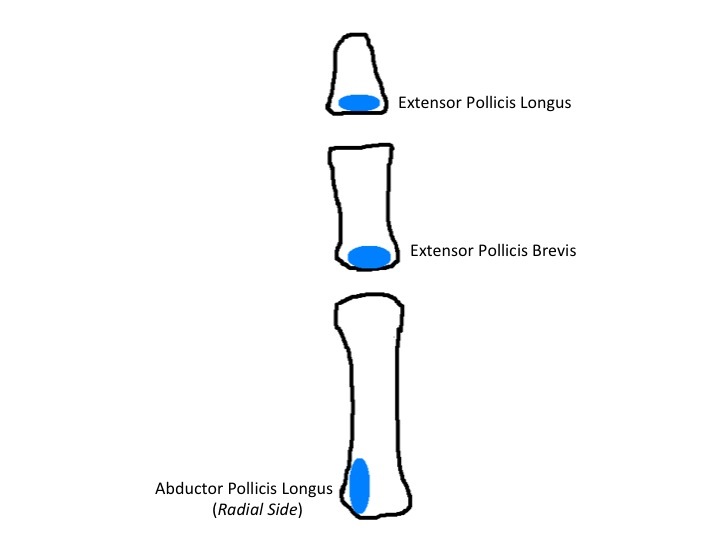 Abductor Pollicis Longus: Origin: Posterior surface of ulna, radius and interosseous membrane. Action: Abducts, extends and laterally rotates the thumb at CMC joint. Innervation: Radial nerve (C7 + C8). One thing that can make life easier when learning about the muscles of the hand is remembering that everything that inserts onto the dorsal surface of the thumb is innervated by the posterior interosseous branch of the radial nerve (C7 + C8)! Another good way to break things down is to remember that the pollux has two flexors, two abductors, two extensors (a longus and a brevis for each), and then an adductor and an opponens. So that narrows down eight insertions down to only five, especially if you’re trying to make sure you’ve covered them all! A final thing that will make life easier is some templates to practice with. I’ve provided two blank outlines and two outlines with the insertion sites on them below, for you to print out and use when studying. References: Lest you think I am this sort of prodigy, I diligently checked all of the muscle origins, actions and innervations using my set of Netter’s Anatomy Flashcards – 3rd edition (Sidebar: They have a KINDLE EDITION now! Insta-wishlist!). E-Hand is also useful for studying. This entry was posted in Anatomy, Hand, Muscle Attachments and tagged Hand. Bookmark the permalink.